Freemasonry isn’t a secret society. It’s a society with secrets. There’s a difference, says Chris Ruli. The world’s oldest and largest fraternity traces its origins to 14th century stonemasons, with the likes of George Washington, Benjamin Franklin and Richard Pryor among its members. Chris joined the brotherhood six years ago after moving to DC for a new job. Chris spent the next year having dinner at Potomac Lodge No.5 with the Masons and guests at their hall. He courted others, but was drawn to Georgetown’s reverence for history and tradition. After a few months as a new member, he began doing some research and saw the lodge archives needed some attention. In its infancy, Potomac Lodge No. 5 was made up of the most affluent merchants and civic leaders in town. It was chartered by Charles Fierer, a German Hessian who was captured at the Battle of Trenton, defected, and became a Major in the U.S. Calvary. After sustaining a battle wound, Charles moved to Georgetown and printed the first newspaper, The Times and Patowmack Packet, in 1789. He became the first Master, or head, of Potomac Lodge No. 5, publishing weekly meeting notices in the newspaper. The first Chief Clerk of Georgetown, John Mountz, was also member, as was the fourth mayor, Peter Casanave—Master of the lodge the year the Potomac laid the cornerstone of the White House. Most notably, the gavel President Washington used the following year during the Capitol cornerstone ceremony now resides—behind glass—at the Capitol Visitors Center, on loan by Potomac. 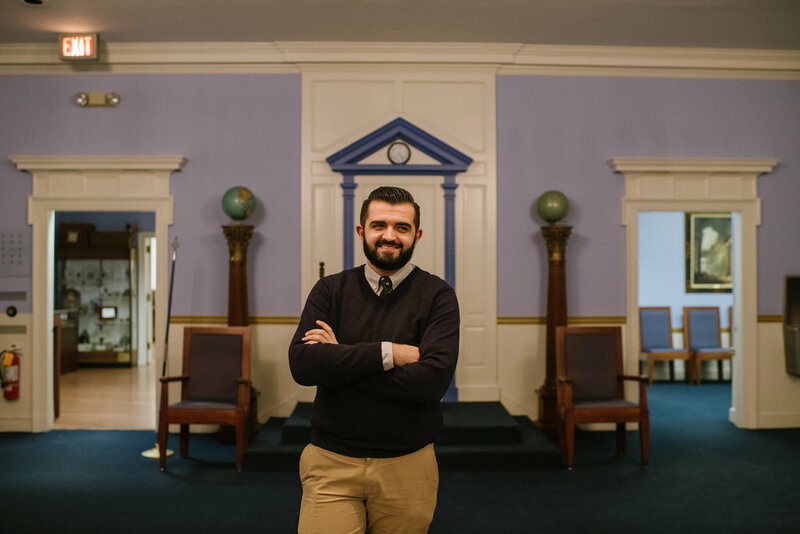 To become a Mason, then and now, members must apply to a lodge, where they are conferred three symbolic degrees—stories and lessons that are taught over time. Masons can also earn additional degrees, receiving more knowledge about a particular story. Often, bi-monthly lodge meetings include lectures on literature, art and music. While the lessons are private, Chris says the basic tenets of Masonry are fairly universal. Moving forward, Chris hopes Potomac can engage with over civic organizations. As for new members, he says the individuals who attend their public events and are interested in masonry are curious by nature. He foresees a younger membership as more Millennials look for an escape from social media and screen time. Women are still excluded from membership, but masonic-affiliated organizations like the Order of the Eastern Star welcome those interested in participating. The brotherhood also transcends cultures and countries—something Chris experienced first-hand during a trip to South Africa. And what about the distinctive jewels worn globally by lodge officers?